1 WEEK UNTIL THE BIGGEST PARTY OF THE YEAR!!! Mardi Gras is right around the corner, literally! We promise that you won’t want to miss out this year! We have something in mind for everyone! Whether you want to go wild and crazy at Pearls Oyster Bar or maybe a more family friendly environment is more your speed then Crabtown in Bricktown is your place to be! Bring the Family on down to Bricktown for a Mardi Gras celebration fit to be king! We will of course have our $5 Specialty Drinks- ALL DAY! Hurricanes, Mai Tais, Flamin’ Hot Cheetoh Bloody Marys & Thunder Ritas all come with a souvenir cup for you to take home! If you prefer beer we will have $2 Abita Ambers all day as well. CRAWFISH CRAWFISH CRAWFISH! We have live crawfish ready for you to devour and crawfish races will be held throughout the evening! We will have tons of giveaways and beads for the entire family plus we even have a face painter for the kiddos from 5pm-8pm! 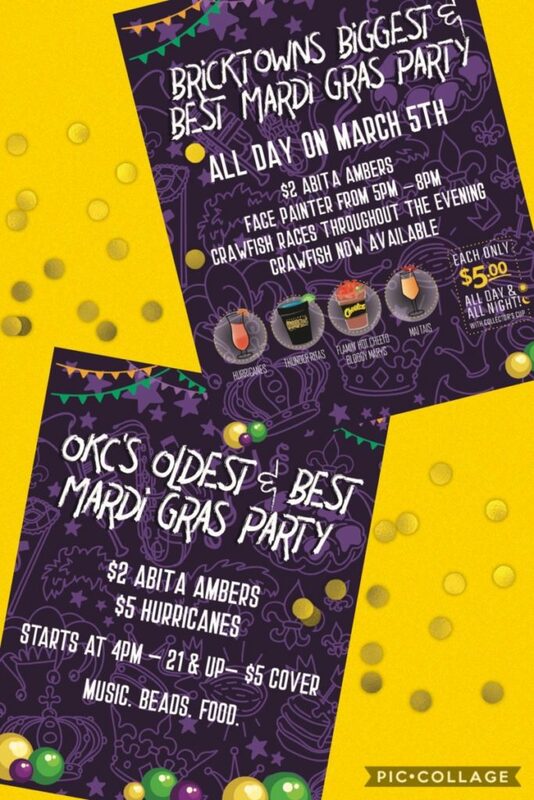 The longest running and most known in OKC…Pearls Oyster Bar is gearing up for a Fat Tuesday you won’t forget! Party starts at 4pm – 21 and UP – $5 Cover Charge with tons of specials!! They will have $2 Abita Ambers, $5 Hurricanes and tons and tons of giveaways!! Plus Beads, Good Food, and Great Music to dance the night away!! Get ready for a good time with great food, fun, family & friends!